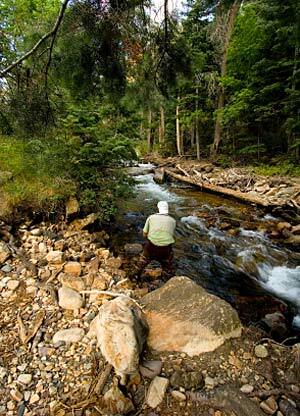 Question: I’ll be fishing some western spring creeks for the first time. I live in Maine, and I’ve never fished for really wary trout before. Do you have any tips? Answer: Those of us who live on the East Coast are not accustomed to fishing in very clear water for really spooky trout, especially ones we can see. When I first went out to Montana to guide, I was astonished by how different the fishing experience was when you could actually spot individual fish. Your question calls to mind an excellent 5-step strategy devised by Bill Tapply, who sadly passed away last week. He was an extremely methodical angler who paid attention to all the details on the water, but he explained his approach very simply. Step 1: Locate the Fish. If you can spot a fish or see rises, this is simple. If there are no visible trout, you need to focus on the most likely holding water. Tapply notes that the largest, wariest fish often hold in places that are hardest to cast to or where it’s very difficult for an angler to get a good drift. This is no coincidence. Look for big trout in slower water, in shadows, and close to obstacles, such as weeds or wood. Step 2: Approach with Stealth. When you spot a good trout, your first impulse will be to cast to it immediately, before it disappears. Tapply argues that you must resist this temptation. Instead, study the lie, the river currents, the bankside vegetation, and the stream bottom to figure out the best place to cast from. You probably won’t get more than a couple shots at a spooky trout, so you want to ensure that you make the cast and drift as easy as possible. If you cast from too far away or across too many conflicting currents, your fly will most likely drag and scare the fish. Once you’ve picked your spot, make your way to it very slowly. If possible, get out of the water and creep along the bank, keeping a low profile. Pay attention to where your shadow—and the shadow of your rod—fall on the water. Since most predators come from above, trout are acutely aware of shadows. Step 3: Study the Fish. Once you’re in position, don’t cast yet! First, take a few moments to interpret the trout’s behavior. Is it rising steadily? Is it sliding side-to-side to pick off nymphs in the drift? If it is rising, try to figure out what it is eating. If the trout’s nose never breaks the surface, he’s probably eating emergers, for instance. Step 4: Tie on the Right Fly. Contrary to common wisdom, Tapply says, even wary trout usually don’t require anexact imitation of what they’re eating. So make your best guess, based on what you see on the water or what you know is in season. If you get a refusal on the first drift, don’t assume that the fly is wrong; it may be that it dragged at the wrong moment. Only after you’ve made several good drifts, should you change your pattern. If you can’t figure out the “right” bug, try throwing an ant or a general attractor pattern. Step 5: Make Your First Drift Count. Even considering the above, your best opportunity to trick a trout is on the first cast, before he’s been put on notice that something is amiss. So before you cast, visualize where the fly will land and how it will drift toward the fish. Anticipate any line adjustments you’ll need to make. If you are positioned far enough downstream, you may be able to make a practice cast that lands below the fish; then you can see how the fly will act on the water. Once you think you’ve got everything figured out, try to make your first presentation the best one possible. Although Tapply created this strategy to deal with wary trout, following these five steps wherever and whenever you fish will help you become a better angler. If you haven’t already read them, his books on fly fishing—A Fly Fishing Life, Bass Bug Fishing, Pocket Water, Gone Fishin’, and Trout Eyes—are full of great stories and plenty of great advice.